Please come ready help Democrats running for office or to run yourself, to tomorrow’s LCDP monthly meeting, 6PM 7 March 2016, topic College Debt, at Mama June’s Restaurant, 3286 Inner Perimeter Road, Valdosta, GA (facebook event). It’s qualiftying week, so now’s the time to decide to run! Some of the open positions include: Lowndes County Board of Education (Districts 4,5,6,7), Lowndes County Commissioner (Chair, Districts 1, 5), Board of Assessors, County Surveyor, Coroner, Clerk of Courts (Probate), Clerk of Superior Court, Sheriff, Tax Commissioner, Solicitor, Georgia Senator (District 8), Georgia House Representative (Districts 174, 175, 176, 177), US Congress (Districts 1, 8). If you’re not motivated enough, try reading about the Lowndes County Commission 4 to 1 vote to sell an easement to Sabal Trail a year after the same commission voted unanimously they didn’t want that fracked methane pipeline in our county or our state. Last month, potential and experienced candidates and volunteers talked about what it takes to run and to elect Democrats, at Lowndes County Democratic Party’s Candidate Recruitment & Volunteer Training Workshop, 1 February 2016, as you can see in these videos, including qualifying fees and fundraising, budgetting, spending, and picking three issues, and yes, the pipeline came up. This entry was posted in Elections and tagged 2016-02-01, 3286 Inner Perimeter Road, candidate, Candidate Recruitment, Chair, Community, Dennis Marks (Vice-Chair / Elections), Elections, Georgia, Glenn Ritchie (Vice-Chair / Membership), Gretchen Quarterman, Gretchen Quarterman (Secretary), James J. Parker (Treasurer), LCDP, Lowndes County, Lowndes County Democratic Party, Mama June's, Monthly Meeting, Politics, recruitment, Richard Saeger (Vice-Chair / Qualifying), Tom Hochschild, Tom Hochschild (Chair), training, Valdosta, volunteer on March 6, 2016 by John Quarterman. It’s qualifying week, so please come ready to run for office or to support those who will run, to tomorrow’s LCDP monthly meeting, 6PM 7 March 2016, topic College Debt, at Mama June’s Restaurant, 3286 Inner Perimeter Road, Valdosta, GA (facebook event). Meanwhile, here are videos of the very interesting January 2016 LCDP meeting on “Local Health Issues”; see the January meeting announcement for speaker list. Videos of the February meeting coming up shortly are also posted. This entry was posted in Uncategorized and tagged Ariel Godwin, Chair, Coach, Georgia, Gretchen Quarterman, Health, John Rogers, LCDP, Lowndes County, Lowndes County Democratic Party, SGRC, South Health District, Southern Georgia Regional Commission, Todd Smoot, Tom Hochschild, Valdosta, VSU on March 6, 2016 by John Quarterman. Today is the day to cast your ballot for who will be the Democratic candidate for president of the United States. You can go vote, take your friends, your neighbors, your relatives! For where, go to My Voter Page by the Georgia Secretary of State. If that’s not working, call the Lowndes County Board of Elections, 229-671-2850. For where your precinct is, see the handy list with links to maps by the Board of Elections. Need a ride? Call the Lowndes County Democratic Party at 229-241-1694. See any irregularities? Call the Democratic Party of Georgia at 678-278-2016 or post on social media with hashtag #gavote411. Also call Deb Cox at the Lowndes County Board of Elections, 229-671-2850. More in a previous post, including for Spanish speaking voters. War and peace, pipelines and fracking, environment and economy, all these and many more issues will be strongly affected by the next president of the United States, plus several Supreme Court appointments that will resound for generations. 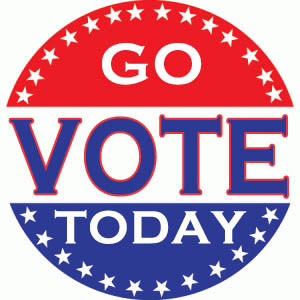 Today’s the day to vote in the presidential primary! This entry was posted in Board of Elections, Candidates, Elections and tagged Bernard Sanders, Bernie, Chair, Elections, Georgia, Gretchen Quarterman, Hillary Clinton, LCDP, Lowndes County, Lowndes County Democratic Party, Tom Hochschild, Valdosta on March 1, 2016 by lowndesdems.